This briefing looks at the international standards regarding disciplinary measures for children in detention and their use in different settings. It also examines the current law and policy regarding disciplinary measures in Kazakhstan, Kyrgyzstan and Tajikistan and makes recommendations to bring these into line with international standards and good practice. This paper emerged from a three‑year project (October 2013-October 2016) managed by PRI Central Asia and funded by the European Union, which is working towards the progressive abolition of violence against children in closed institutions in Kazakhstan, Kyrgyzstan and Tajikistan. 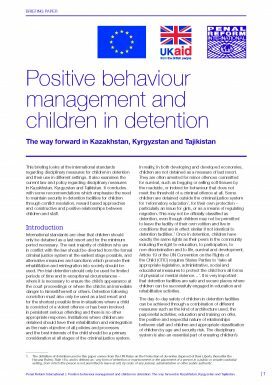 2014 survey of the experiences of children in closed institutions in Kazakhstan, Kyrgyzstan and Tajikistan, with a focus on their experience of violence and ill-treatment.